His Holiness Pope Shenouda III (Gayyid) was the 117th Coptic Orthodox Pope of Alexandria (1971-2012). He died on March 17, 2012. His Holiness was born on August 3, 1923 in the city of Assiut in Upper Egypt; he was given the name of Nazir Gayed. He obtained his Bachelor of Arts degree in History in 1947 from the University of Cairo. Mr. Gayed was very active in his church and served as a Sunday School teacher, first at Saint Anthony's Church in Shoubra and then at Saint Mary's Church in Mahmasha. He worked as a high school English and Social Studies teacher in Cairo by day, and attended classes at the Coptic Theological Seminary by night. Upon graduation from the seminary in 1949, he was chosen to teach New Testament Studies. He was appointed in 1953 as a teacher in the Monastic School. From his youth, His Holiness enjoyed writing very much, especially poems; he is a remarkably literate man as evidenced by the over 100 books that have been written by him. For many years, he was the Editor-in-Chief of the Sunday School Magazine. At the same time, he followed his post-graduate studies at the Seminary of Archeology. On July 18, 1954, Mr. Gayed was led to the monastic life at "El-Suryan" Monastery in the western desert of Egypt; he was given the name of Father Antonyos El-Suryaani. For six years, from 1956 to 1962, he lived a life of solitude in a cave about seven miles away from the monastery, dedicating all his time to meditation, prayer, and asceticism. He was among the candidates nominated for the papal throne in 1956, but Pope Cyril VI was the one ultimately chosen for the post. In 1962, he was ordained by the late Pope Cyril VI as Bishop of Ecclesiastical (Religious) Education and was named President of the Coptic Theological Seminary; he was given the name of Bishop Shenouda on September 30, 1962. Continuing from his literary past, Bishop Shenouda published the first issue of "El-Keraza" magazine in Arabic in 1965, and remains the Editor-in-Chief to this day. Bishop Shenouda was suspended in 1966 by Pope Kyrillos VI.,  This was essentially the result of Bishop Shenouda's (and students') enthusiastic 'campaigns for change' that used rather strong words, e.g., supporting people's right to choose their bishops and priests, a principle he later applied when he became pope after the repose of Pope Kyrillos VI. This "conflict" between Pope Kyrillos VI and Anba Shenouda seems to have later been resolved. On November 14, 1971, His Holiness was enthroned as Pope Shenouda III, the 117th Pope of Alexandria, and successor of the see of St. Mark. Some argue that the choice of Pope Shenouda III as Pope (and Bishop) of the City of Alexandria is not canonical (against Nicea Canon 15 and other Church councils/canons), because His Holiness was already bishop (with another episcopate) in the 1960s., , , , , and p.30 onward in  However, there are also modern day examples from other Churches of patriarchs who were previously bishops before their election as patriarchs, e.g., , . His Holiness Pope Shenouda III was born the youngest of eight children (five sisters and two brothers) on August 3, 1923 in the Upper Egyptian province of Assiut, and was named Nazeer Gayed. His mother passed away shortly after his birth. By the age of sixteen, Nazeer began service in the Sunday School of St. Anthony's Church in Shoubra, Cairo, where he also went to school. In 1943, Nazeer entered the University of Cairo and completed a Bachelor of Arts in English and History while he spent his summer vacations at the Monastery of St. Mary (Souryan). Although at this time only graduate students were admitted to the evening classes at the Coptic Theological Seminary, Dean Archdeacon Habib Guirguis admitted Nazeer while he was still in his final year of undergraduate study. After graduation from the University of Cairo in 1947, Nazeer completed his military service and began work as a teacher of English and History. Meanwhile, he completed his Bachelor of Theology and the Dean appointed him as lecturer in the Old and New Testaments. In 1950 Nazeer resigned from his secular employment to take a full-time lecturing position. In 1953, he was appointed a lecturer at the Monastic College in Helwan. Nazeer and other servants labored for several years to establish a strong Sunday School and youth group at St. Anthony's Church in Shoubra. his service produced hundreds of devoted servants who began establishing youth groups in neighboring parishes. The road to monasticism was a natural consequence of the desire from his early years to consecrate his life to Christ. "...I found in monasticism," Pope Shenouda once said, "a life of complete freedom and clarification." he joined the Souryan Monastery in Wadi El-Natroun and, a year later, he was ordained a priest, taking the name Fr. Antonyos (Anthony) El-Souryani. In 1959, His Holiness Pope Kyrillos VI appointed Fr. Antonyos as his personal secretary. On September 30, 1962, Pope Kyrillos VI ordained Fr. Antonyos as Bishop Shenouda, the first bishop for Christian Education. He became the President and Dean of the Theological Seminary, and by late 1969 the enrollment of full-time students doubled and the enrollment of part-time students increased 10 times its original number. Under his presidency, women were admitted to the College and several were appointed lecturers. His Grace's efforts were recognized in 1969 when he was elected President of the Association of Middle East Theological Colleges. On March 9, 1971, His Holiness Pope Kyrillos (Cyril) VI departed in peace. The Holy Synod met on March 22 to plan for the election of the new Patriarch. Among the final three candidates was Bishop Shenouda. On October 31, 1971, the altar ballot was conducted during the divine Liturgy on the Feast of Saint Reweis. At the end of the Liturgy, His Eminence Metropolitan Antonyos, laid his hands on a young boy who was then blindfolded and told to choose one of the three pieces of paper from the box. The ballot box had been taken from the altar and placed on an elevated table. As the congregation prayed the Lord's Prayer and the words "Lord Have Mercy," the boy chose one of the pieces of paper and gave it to Metropolitan Antonyos, who then joyfully declared God's chosen shepherd for His church as His Grace Bishop Shenouda, Bishop of Education. On November 14, 1971, in Saint Mark's Cathedral in Cairo, His Holiness Pope Shenouda III was enthroned as 117th Pope of Alexandria and Patriarch of the See of Saint Mark. His Holiness became the first patriarch of Alexandria since the fifth century to have been Dean of the Theological Seminary. He continues to lecture at the branches of the Seminary in Cairo, Alexandria, and abroad and at the Higher Institute of Coptic Studies. To meet the expanding ministry of Christian education, His Holiness established other branches of the seminary in Egypt, as well as three graduate institues: Biblical Studies, Hymnology, and Coptic Language. On November 29, 1993, he officially opened the Institute of Pastoral Care. For his erudition in theology and scripture, His Holiness has been awarded four honorary Doctoral Degrees in Theology, three from American Universities and one from a German University. His Holiness' edifying and spiritually uplifting sermons have won international acclaim; in 1978 the Browning Institute awarded him the prize for the best Christian preacher in the world. His Holiness is also the author of more than eighty books on a variety of subjects, and over the past 20 years, he has been the Editor-in-Chief of the Church's official magazine, EL-KERAZA. His Holiness ordained more than seventy bishops, established general bishoprics, including the first Bishopric of Youth, more than four hundred priests, and countless deacons for Cairo, Alexandra and the Churches abroad. This extended the pastoral care to every city, village and family all over the See of St. Mark. His Holiness continually holds meetings and seminars with the clergy to discuss any pastoral problems or needs. His Holiness also gives special attention to the service of women in the Coptic Orthodox Church. "We felt a great need of the work of women and we wanted women to have a certain order and service in the Church, not only to have girls as Sunday School teachers who give a part of their time whenever they can, but we want girls and women to give their whole life to God and serve the church." His Holiness says. Despite his many responsibilities, His Holiness usually manages to spend three days a week in the monastery. His love of monasticism has led to a monastic revival in the Coptic Church. He has ordained hundreds of monks and nuns and renovated and reestablished many monasteries and convents. He is the first Pope to establish Coptic monasteries outside of Egypt, which presently number eight. As a Bishop for Christian Education, His Grace has overseen the education of Sunday School Curriculum, and during his papacy, has continued to hold meetings for Sunday School teachers to establish a Sunday School curriculum for the churches abroad. During the early years of his enthronement, His Holiness Pope Shenouda had an amicable relationship with the late Egyptian President Anwar El-Sadat. However, during his presidency, violent Islamic fundamentalist groups increased all over Egypt, especially in the Universities. They started to attack the Copts, vandalize their businesses, and burn their churches, which led Pope Shenouda to protest to the government against this repeated violence. In spring 1981, Pope Shenouda refused to hold any public Church celebrations of Easter and didn't receive that year the President's delegates who are regularly sent to greet the Church and Coptic Christians on such occasions (this particular move by Pope Shenouda III was very embarrassing to President Sadat, both nationally and internationally). Sadat reacted by issuing a presidential decree to exile His Holiness to the Monastery of St. Bishoy, imprison eight bishops, twenty-four priest, leading Coptic lay figures, and ban “El-Keraza" magazine and “Watany" newspaper. Despite having to spend forty months away from his flock, His Holiness continued to care for his church. He saw the exile as an opportunity for spiritual retreat and wrote sixteen books during that time. A month after his decree, Sadat was assassinated by the same fundamentalist groups. After much effort from His Holiness’ children inside and outside the Coptic Orthodox Church, and after three and a half years, the succeeding Egyptian President Hosni Mubarak, released Pope Shenouda from exile. Accompanied by many bishops, His Holiness returned to St. Mark’s Cathedral in Cairo, where more than ten thousand people filled the Cathedral to receive the Pope. His Holiness, after praying the Prayer of thanksgiving, greeted the flock with these words: “I have no residence except in your hearts, which are full of love. I have never been away from your hearts, not even for a twinkle of an eye." He went on to say “I would like to do my best to deepen love, peace and reconciliation between the Church and the State, between the Church and our Muslim citizens. We are like organs in the one body, which is Egypt." His Holiness works tirelessly to improve relations between the Christians and Muslims in Egypt, in order to establish a peaceful social environment and to dispel sectarian divisions. The Pope and the president of Egypt, Hosni Mubarak, are in good relations, as well as with the moderate Muslims in Egypt. 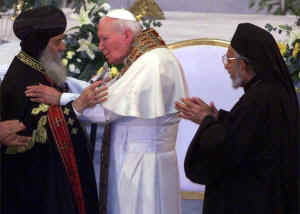 His Holiness Pope Shenouda is well known for his deep commitment to Christian unity. In an address he gave at an ecumenical forum during the International Week of Prayer for Christian Unity held at Saint Mark's cathedral in Cairo in 1974, His Holiness declared that: "The whole Christian world is anxious to see the Church unite. Christian people, being fed up with divisions and dispersion, are pushing their Church leaders to do something about Church unity and I am sure that the Holy Spirit is inspiring us." He has emphasized that Christian unity must be founded upon a unity of Faith and not upon a unity of jurisdiction. Before his enthronement, Bishop Shenouda attended the first unofficial ecumenical consultation between theologians of the Oriental Orthodox and the Roman Catholic Churches, in Vienna in September 1971. The agreed statement included the words: "We believe that our Lord and Savior Jesus Christ, is God the Son incarnate; perfect in His divinity and perfect in His humanity. His divinity was not separated from His humanity for a single moment, not for the twinkling of an eye. His humanity is one with His divinity without commixture, without confusion, without division, without separation. We in our common faith in the one Lord Jesus Christ regard His mystery inexhaustible and ineffable and for the human mind never fully comprehensible or expressible." (From the Communique of the first nonofficial ecumenical consultation between theologians of the Oriental Orthodox and the Roman Catholic Churches, in 1971). In May 1973, His Holiness Pope Shenouda III paid a cordial visit to His Holiness, the late Pope Paul VI in Rome. This was the first meeting between an Alexandrine and Roman Pontiff since the time of the great schism of 451 AD. Both Popes signed a common Declaration, containing, amongst other things, a confession of common Faith in the mystery of the Word Incarnate. In welcoming His Holiness to Rome, the late Pope Paul VI said, "You are indeed the head of a church whose origin goes back to the Evangelist Mark and which had in Saint Athanasius...the invincible defender of our common Nicene faith, that is, faith in the divinity of our Lord Jesus Christ." In response, His Holiness Pope Shenouda said, "We have to declare that between us there are many points of agreement in the principles of faith. As for points of difference, there is no doubt that after fifteen centuries of study, examination, and controversy, we are at much nearer grounds of agreement than our ancestors of the fifth and sixth centuries. We are all more ready and more intense in our desire to reach solutions for differences and attain simpler expressions of our common faith." Following this historic encounter, a joint Commission was established to explore the road to full intercommunion between the two Apostolic Churches. See Pope Paul VI and Pope Shenouda III's Common Declarationand other joint meetings/reports. In June 1989, His Holiness opened the conference of the International Commission for Inter-Orthodox theological Dialogue. A part of the agreed statement said: "When we speak of the one composite (synthetos) hypostasis of our Lord Jesus Christ, we do not say that in Him a divine hypostasis and a human hypostasis came together. It is that the one eternal hypostasis of the Second Person of the Trinity has assumed our created human nature in that act of uniting it with His own uncreated divine nature, to form an inseparably and unconfusedly united real divine-human being, the natures being distinguished from each other contemplation (theoria) only....We agree in condemning the Nestorian and the Eutychian heresies. We neither separate nor divide the human nature in Christ from His divine nature, nor do we think that the former was absorbed in the latter and thus ceased to exist" (First Agreed Statement with the Byzantine Family of Orthodoxy in 1989). See also Dialogue With the Byzantine Family of Orthodoxyand Latest Agreed Statement (With the Ecumenical Patriarchate). Until now, His Holiness initiates and closely monitors theological dialogue with the Eastern Orthodox, Roman Catholic, Anglican, Swedish Lutheran, and the World Alliance of Reformed Churches. His Holiness also served as one of the Presidents of the World Council of Churches and the Middle East Council of Churches. See also Meetings of Oriental Orthodox Churches, Dialogues With Other Churchesand Report About Relations With the Russian Orthodox Church. When His Holiness Pope Shenouda III was enthroned, there were only seven Coptic churches outside of Egypt: two each in Canada, the United States of America, Australia, and one in England. Due mainly to the efforts and encouragement of His Holiness, today there are more than 300 churches outside of Egypt, of which more than 100 are in the United States. There are two theological seminaries in the U.S., and a monastery in California. In addition, His Holiness was the first Pope to ordain Bishops for the Dioceses of North America. Bishop Karas was ordained for the Monastery of St. Antony's in California, Bishop Serapion for the Diocese in Los Angeles, Southern California, and Hawaii, and Bishop Youssef for the Southern United States. There are 24 churches in Canada, and the city of Toronto houses a large Coptic Cultural Center. In Australia and New Zealand, there are currently 28 churches, a theological college, two secondary schools, a primary school, two monasteries and a nursing home, plus two churches in Fiji. In Europe, there are currently over 50 churches. There are six churches and a large Coptic cathedral in Great Britain, including a large Coptic Center in Birmingham and another one in Stevenage. There are churches in Ireland, Scotland, and Wales. There are nine churches in Germany and a monastery in Frankfurt. There are six churches in France, four in Austria, four churches and a monastery in Italy, two in Holland, two in Switzerland, and one church each in Belgium, Denmark, Greece, and Sweden. In November 1991, the first Coptic Churches were established in South America, with a church in São Paulo, Brazil and in Argentina, and more recently churches have also been established in Bolivia and Mexico. Priests have also been ordained for churches in the Caribbean, including Bermuda, the Virgin Islands, and the West Indies. As head of the oldest Church in Africa, His Holiness Pope Shenouda III has been very keen to extend the Apostolic mission of St. Mark across all of Africa. There are now 33 Coptic Churches among more than 12 African tribes in nine African countries, including Kenya, Zaire, Zimbabwe, Namibia, and South Africa. Nairobi is also the center of the new Diocese in Kenya. The Ethiopian Orthodox Tewahido Church (EOTC) has strong historical ties with the Coptic Orthodox Church. The two churches have been linked by very intimate relations since the early centuries of Christianity, as both are children of St. Mark the Apostle. In 1994, upon request of the EOTC, they gained Autocephaly (independence)from the Coptic Church. Both Churches still belong to the See of St. Mark and both confess one Orthodox Doctrine. Eritrea, upon gaining independence from Ethiopia, received pastoral care from His Holiness Pope Shenouda by his ordination of Eritrean Bishops to form the Holy Synod for the Eritrian Orthodox Church. His Holiness has made dozens of pastoral visits outside of Egypt. The most extensive tour took place from August to December 1989, when he made an historic 112 day visit to all the Coptic Churches in Europe, the United States, Canada and Australia. During his trip, His Holiness laid foundation stones of new Churches, consecrated most of the altars in the churches, baptized hundreds of children, ordained hundreds of deacons, delivered many lectures at theological seminaries and universities, opened a theological seminary in New Jersey and in Los Angeles, and conducted numerous spiritual meetings. In the United States, the mayor of Jersey City hoisted the Coptic Church flag side by side with the American flag at City Hall during the Papal visit. The US House of Representatives invited His Holiness to open a congressional session with prayer. His Holiness also met with former US President George Bush and requested that "he give a big push" to peace in the Middle East. In a previous visit, His Holiness met with former US President Jimmy Carter. Afterwards His Holiness and Carter became good friends. More recently, Pope Shenouda III underwent spinal surgery at Cleveland Clinic in Cleveland, Ohio, USA, on 22 October 2006. Pope Shenouda III has since then fully recovered, and celebrated the 35th anniversary of His Holiness' enthronement as Pope of Alexandria on 14 November 2006 in Egypt, among thousands of faithful who flocked to congratulate His Holiness on this occasion (videos). These have recently come to the attention of the mainstream secular newsmedia in Egypt (see, for example, this Egyptian newspaper article in English published on February 23, 2007). More recently a book entitled Orthodoxy: A Creed for Today (1972) by the Very Rev. Fr. Anthony M. Coniaris has been banned by the Holy Synod of the Coptic Church presided by Pope Shenouda III on May 26, 2007, as it discusses the Orthodox concept of theosis, which was considered to be against Pope Shenouda's teachings. Wikipedia has further details about the subject. Some learned observers have attributed Pope Shenouda's decades-long theological disputes with different Coptic theologians (like the late Father Matta El-Meskeen) to personal and ecclesiastico-political motives, rather than to any genuine doctrinal flaws or deviations from Orthodoxy in the writings of these theologians. See also the 2007 conflict of the Coptic Church with the Catholic and Protestant Churches in Egypt: Bishoy_(Nicola)_of_Damietta#A_.22controversial.22_figure. This page was last edited on November 5, 2012, at 08:25. This page has been accessed 75,793 times.